Our middle school youth are discovering their gifts and talents – and how they can use these gifts and talents to serve God and their community! Thus, we encourage our middle school youth to join parish activities, train them to be leaders and give them space to reflect on how their actions connect to the Gospel. In small group settings with adult catechists, our middle school youth reflect on the Scripture in age appropriate activities. All Child and Middle School Youth Ministry Classes (K4-8th grades) meet on the same weekend, at the same time (9:15 a.m. – 10:15 a.m.) Financial assistance is available to those who need it. Throughout the year, we advertise service opportunities to middle school youth and their families. Past activities include serving as counselors at our bible camp, baking and/or serving food at St. Ben’s Meals or All Saints Catholic Church, and providing hospitality at parish events. Middle school youth are also invited to serve in the various parish ministries. Youth in 6th through 8th grades are invited to attend our monthly family service projects with their families or as peer leaders. Please check the 2018-2019 calendar for the dates. More information will be provided each month. 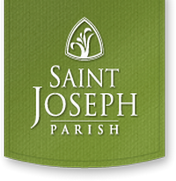 Please contact Sheri Hanson, Director of Child and Youth Ministry (shanson@stjosephparish.org/262-375-6500 x 175) or the coordinators of the various parish ministries for more information. Retreats are a wonderful way for our middle school youth to interact with their Catholic peers. High school youth and adult leaders facilitate activities in which the middle school youth can discover God’s love and learn about different Catholic rituals. Child Ministry students are invited to express and share their faith with the parish through an annual art show. Students’ original masterpieces, which illustrate an aspect of their faith, a bible passage, or a Church event, are displayed for the parish to view, reflect on and appreciate. Our next art show will be the weekend of February 2-3, 2019 after all Masses.